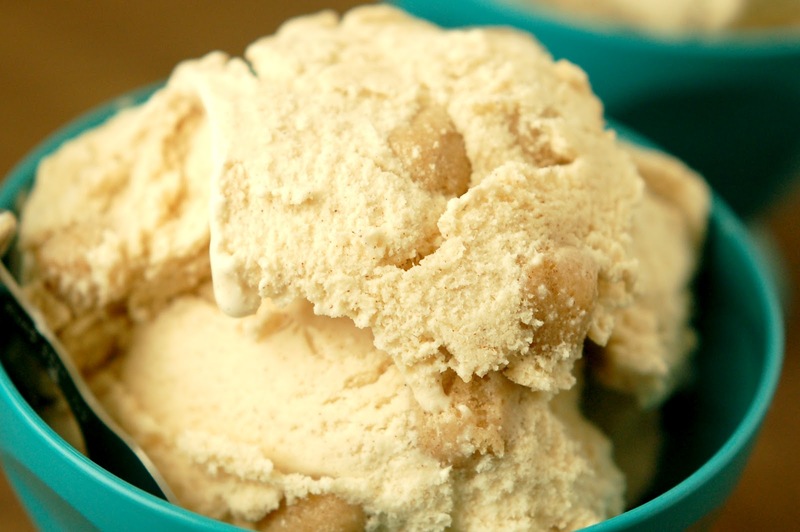 This ice cream is light and loaded with flavors of a snickerdoodle cookie. I used a lot of cinnamon because I love the stuff, if you are not such a huge fan, you may want to decrease the amounts slightly. The richness of the half & half and the sweetened condensed milk give the allusion of the rich, buttery flavor of the actual cookie. And as always, one of the best parts (along with it tasting amazing) is that it is really easy to make. So go ahead and try it! I bet you have most of the ingredients in your cupboards right now! Stir together flour, sugar, sugar substitute, brown sugar, salt, cinnamon, and nutmeg until combined. Add in butter, vanilla, and milk. Stir until a soft dough forms. Form dough into 1/4 – 1/2 inch balls. (I made half small and half larger to distribute the flavor but also have big bites of cookie dough!) Place cookie dough bites in a freezer safe container and store in the freezer until ready to add to the ice cream. Whisk together half & half and sweetened condensed milk. In a small bowl, stir together brown sugar and cinnamon. Add to milk mixture and whisk to thoroughly combine. Pour in ice cream maker and freeze according to manufacturer’s instructions. Five minutes before the finishing time or when ice cream is soft set, add the cookie dough bites and allow machine to finish churning. This recipe is linked with Cast Party Wednesday, Crazy Sweet Tuesday, Heavenly Treats, Martha Mondays, Mop It Up Mondays, Strut Your Stuff Saturday, Sweet Treats and Swanky Stuff, Talent Show Tuesday, Thursday Treasures, Totally Tasty Tuesday, Weekend Potluck, What’s in the Gunny Sack, and What’s Shakin Link Party. This is SO perfect! I love cookie dough ice cream and so does my husband. I love this, great adaptation!! Thanks Cassie! I loved your confetti cookie dough bites! oh i will be making this, needed a new ice cream recipe, my ice cream maker is ready! I hope you give it a try! Let me know how it turns out! Oh my word, Patrick would go nuts over this Jessica! Definitely will have to save it for a rainy day! My husband loved it! I think I’ll be making it again before too long! 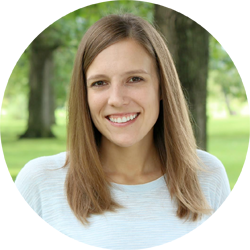 Jessica, you’ve done it again! This looks AWESOME. 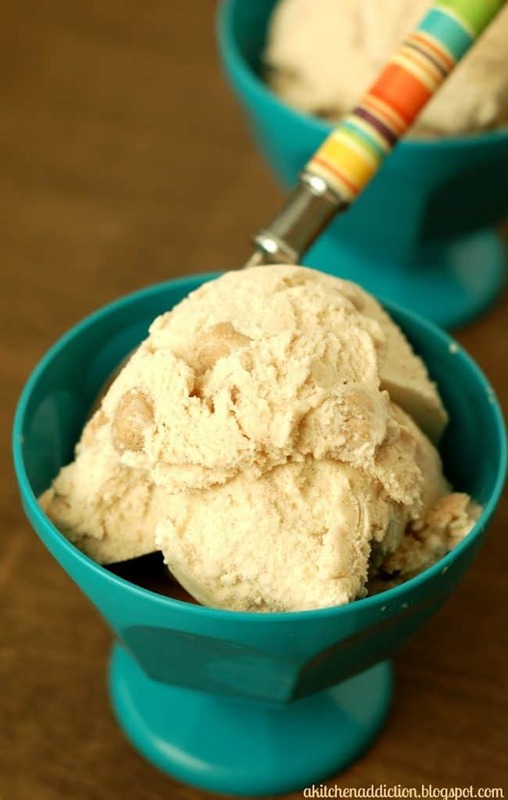 When I made snickerdoodle ice cream awhile back, I never thought to add snickerdoodle COOKIE DOUGH to the batter… simply genius! Look at all those chunks 🙂 yum! Are you kidding me?? Cookie dough ice cream has been my favorite forever and I LOVE snickerdoodles! I’ve never tried snickerdoodle cookie dough ice cream and I’m completely in love with the idea. I’d have to make a double batch of the dough so that I could bake some cookies up too. Looks wonderful! Thanks Julia! Pretty sure I ate about half of the dough while I was making the bites to go in the ice cream! OMG. I need this! As soon as my ice cream maker gets here this is happening!! Mmmmm…I love those big pieces of cookie dough! Scrumptious! This looks amazing! I can’t wait to try making it!! YUM! Wow, I don’t think I’ve ever craved sugar this much first thing in the morning. I want to stick my face in this ice cream! Oh, I think it would make an excellent breakfast! I definitely want a big bowl of this with many big hunks of cookies. Great idea! I can almost taste it, if only I could. 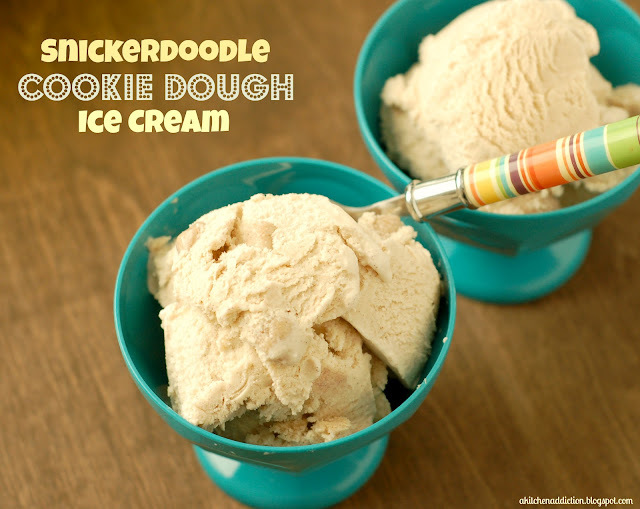 Cookie dough ice cream is awesome, and I love that you made it with snickerdoddles! It’s a great combo! We will definitely be making this more often! Yes! Love cookie dough in ice cream! Hey – I clicked both links from Crazy For Crust linkup 🙂 This ice cream looks as good as the PB & banana donuts! Thanks for stopping by Nicole! I just saw your carrot cake ice cream and now I really want to try that next! Oh my goodness! I love snicker doodles and ice cream! What a fabulous combination! Brilliant! Have a great week sweetie! Amazing!! I have to try this! I love anything cinnamon! i love snicker doodles and i love ice cream – sounds like the perfect dessert! love it!! I LOVE snickerdoodles so this ice cream is just perfect for me!! Can’t wait to make this! WOW! This ice cream is like my favorite thing EVER. I need to try it. PS want those bowls. And the spoon! Can you just pass me a spoon? I love snickerdoodles! In Ice Cream form, even better. And with cookie dough chunks, now it’s over the top! Pinned! Wow! And our son loves snickerdoodles. Yes please!! This looks unbelievable and I am featuring it today!! Thanks SO much for sharing it with us! I just made this and am blown away by how good it is! I’ve made loads of ice creams, but never a sweetened condensed milk-based ice cream. I’ve always stuck with eggs. Love the cookie dough bits and the ice cream itself. This stuff is definitely a winner. Thanks so much for sharing the recipe. My husband will be more than smitten when he gets home to his requested birthday ice cream!